I’m not good with disguises and trying would have been worthless. I’d cooked with Ryan Steyn, chef-owner of El Jardin por Ryan Steyn (El Porvenir, Valle de Guadalupe, Baja California), the week before. He knew I was a food writer and his whole place (kitchen included) was out in the open. Any idea he wouldn’t identify me was at best aspirational. As Los Angeles Times food writer Jonathan Gold wrote, the concept of “reviewer anonymity” comes down to me “pretending not to notice that a restaurant staff is pretending not to notice me noticing them noticing me.” So chef Steyn greeted me before I even sat down. Anonymity was not for this day, not for this review. The first course of our tasting menu was a garden salad with croquettes of trout from a river in nearby Ojos Negros. It featured spectacularly fresh lettuce and tomato with vinaigrette that was simple, perfect and just enough. Beet chunks were toothsome with an echoing beet purée—swiped attractively around the inside of the bowl—acting as a sauce for the precisely fried trout balls (crisp and caramelized on the outside, soft and savory inside). But too gorgeous? The next table got a different presentation. Was I getting special treatment? 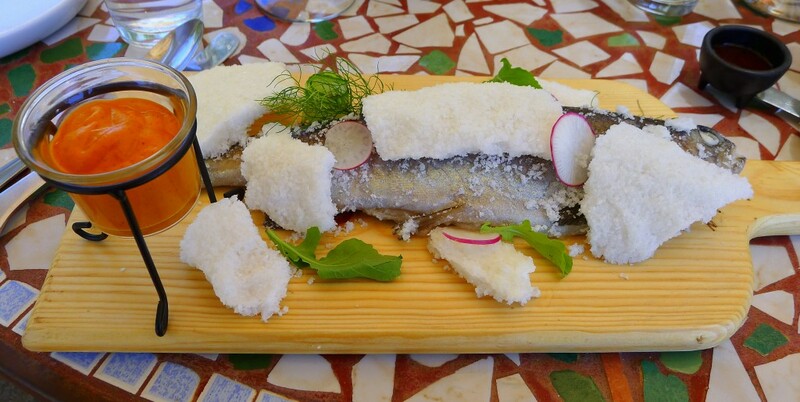 Ojos Negros trout made another menu appearance, cooked in a salt dome and served with a Spanish-style remoulade sauce. It’s always amazing how cooking in so much salt brings out the sweetness in the fish and not as much saltiness as one would expect. A tataki of jurel (local yellowtail) may have been the dish of the day. The yellowtail itself was perfectly seared on the outside, raw on the inside, with a drizzle of sauce that mimicked a Japanese ponzu but with a deeper umami feel. Caviar, radish and maize garnishes provided textural contrast, arugula offered freshness and avocado brought richness. A meal at a Valle de Guadalupe campestre restaurant is not complete without grilled quail. Steyn’s did not disappoint. Pork belly, another Valle favorite, showed up in a terrine a la plancha with salsa verde and pickled onions and hit all of the right notes of fatty goodness, contrasting textures and a pickle to cut through the fat. And then a dessert: a single quenelle of black sesame gelato over crumbled, crispy, sweet buñuelo bits. The overall effect was of a deconstructed (and completely reconstructed) halva candy bar in a bowl. Simple, deeply flavored, refreshing and simultaneously indulgent and light. It reminded me of something. And suddenly I remembered Steyn’s dessert from the Barrel Smoker Dinner at which I’d worked with him the previous week—smoked chocolate mousse with smoked creme caramel, blueberries and chipotle. Both desserts displayed simple ideas done in surprising ways, great textural contrast and flavors crossing the sweet-savory borderline. I didn’t need anonymity to assure me this was Steyn’s food. He hadn’t known I’d come that day and made me dishes perfectly in line with what I’d seen working right next to him. I feel comfortable saying that what I had is consistent with what you’d have. And it would be a good idea for you to have some.